This listing DOES NOT INCLUDED THE HAIR BOW or instructions on how to tie the bow it is just an idea of what you can do with the design. This listing is for a in the hoop Back to School School Kindergarten Rocks Hair Bow Center Embroidery Design Machine Applique. With your purchase you will receive the applique in 2 sizes: all made in a 4X4 hoop. 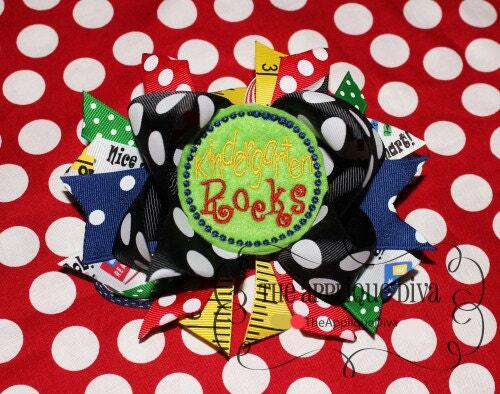 This listing does not include the Hair bow it is just an idea of what you can do with the design. You will also receive a step by step tutorial with pictures showing you how to do the appliques in the hoop. These are very easy and fun to do!! !